How do I know if the batteries are flat? If the batteries have depleted in power significantly, when you press down the power button to switch on, not all of the of the LED lights in the ‘on sequence’ may illuminate. The most important LED is the last single LED that flashes to show the flow rate setting (the LED that flashes after the on sequence). If there is not a complete on sequence or the LED does not flash, the batteries have been exhausted. If this is the case, replace the batteries as shown in our guide. What if I break a part of my system? Replacement parts are available for all our Revo systems so if you destroy your rear mech, you won’t need to buy a whole new unit, simply replace the missing parts and you’re back up and running again. How durable are the Revo systems? The Revo’s have been tested in the harshest of environments and have proven capable of withstanding some pretty extreme conditions, from the wilds of Scotland, through the dry and dusty trails of Colorado to the bitter and jagged trails of Norway and beyond. Both units are designed to IP (Ingress Protection) 66 standards making them “dust tight” and “protected against heavy seas or powerful jets of water”. Although not designed for IP67 (Submersion) they have proven in many tests to be capable of withstanding immersion for periods of time such as during extended river crossings for example. The ultimate test of our systems though is with our pro-team partners. the level of use and abuse they receive in just a week is equivalent to what many will put them through in months or years. Surviving this test is the ultimate measure of their durability. How are Via Fluid and Terra Fluid different? Terra Fluid is thinner (less viscous) than Via Fluid as it has been optimised for maximum cleanliness whereas Via Fluid is optmised for maximum efficiency. Neither Via Fluid nor Terra Fluid have tackifiers in them, this is key to how we can keep the transmission so clean. Can Via & Terra Fluid be used in either the Revo Via or Revo Terra? Yes, both Fluids are compatible with each other and interchangeable, so if you have a go-anywhere bike you can choose the fluid most suited to your current ride location. Can the system be used on mountain bikes as well as road bikes? Yes, the Revo Via and Revo Terra can be installed onto a variety of different bikes, including Road bikes, Triathlon or TT bikes, Gravel, Cross and e-bikes. The reservoir can be located in a number of different places on the bike, depending on your preference and the design of the bike, including using the bottle cage mounts or even mounting under the down tube. Is there any chance that Fluid will get onto the brakes? The Fluid is only applied in very small micro-doses (0.03ml per pump application). At its highest setting it would take over 1 hour to dispense the same amount of fluid as would usually be applied when lubricating the chain in the traditional way. If for some reason the fluid did come into contact with the brakes then it can easily be cleaned with water and it will not damage the braking surfaces. No. Via Fluid and Terra Fluid have been specifically designed to meet riders needs under any conditions. We are able to achieve this through the continual application of the fluid while you ride. You can increase the speed of application of the fluid for worse conditions or decrease on a fine dry day. You can even adjust while riding if the conditions change. Do I still need to lube and clean my chain occasionally even when using the system? You will not need to lubricate your chain at all – the Revo systems will take care of this for you. All you will need to do is occasionally refill the reservoir. In terms of cleaning, we would recommend you properly clean and degrease your transmission when installing your system to start from the very best position. Then, after a ride, you can simply clean down the chain and cassette with water before pressing the ‘boost’ button to re-apply more fluid ready for the next ride. Are the Revo Via and Revo Terra race legal? Both Revo’s are race legal and can be used in all cycling events. We have been in communication with the UCI and have a written communication from them stating as such. In addition, we have also been given approval by the ITU for our products to be used in all Tri sport events, including Olympic (Standard), Full and Half Ironman events as well as shorter course races. How do I clean my Revo? If your Revo is subject to dirt ingress, which is restricting the flow to the pump then we recommend that you drain the reservoir and then put lukewarm water in the system and pump the system through using the prime button. This should clear any contaminants and free up the pump. Can I move my Revo from one bicycle to another? The system is reasonably straight forward to install and uninstall. It is however plumbed in using tubing which carries oil. In order to fit the system to another bike we would recommend that you completely remove all parts from the original bicycle and then move the whole system to the new bicycle. You may be able to leave some of the accessories and tubing on both bikes making a quicker change over possible and additional parts are available for all our systems to help with this. When disconnecting either end of the tubing, please be aware that the fluid may run through the tube freely. How do I clean my chain before fitting a Revo? Using your favourite chain cleaner or paraffin and a small brush is the easiest way to do this, a method recommended by both chain and bicycle manufacturers. Once you’ve cleaned the chain, we’d suggest drizzling a little Via or Terra Fluid all along it, and wiping off the excess. This will provide an initial film of oil where it’s needed – the system can then be set to 1 drop per 90 secs to maintain this film and adjusted as necessary. Does fitting a Revo take away the need for all chain maintenance? The simple answer is no. Depending on your current process a Revo will take over the lubricating and optimisation of your chain. The specially formulated fluid we use will be less contaminated than other lubricants making any cleaning far easier. We always recommend inspecting your chain for signs of wear, damage or stretch before any ride. A clean and lubricated chain is a happy and healthy chain. The Revo Via and Terra are designed to maximise your chains performance. • IP66 Enclosure – IP rated as “dust tight” and protected against heavy seas or powerful jets of water. The Revo is not designed for IP67 (Submersion). Why have you chosen to use 2 x N disposable batteries instead of lithium rechargeable? When designing the Revo’s we tested numerous types of technologies including batteries. The system is a pumped system and therefore the current (amps) considerations for activating the pump were key along with the lifespan of the batteries and the potential charging time. Using the system and its electronics regulation we are able to achieve 150+ Hours on the most frequent pump setting using 2 x N Batteries. These batteries are also readily available across the world and if you are ever out on a ride, then they can be easily picked up in most stores. Due to the connections of the system (almost like plumbing) the system is not designed to be removed every night or couple of days therefore in order to charge a lithium type cell the end user would need to have access to a charging point close to the bicycle. In the future we will look at these options as technology and charging mechanisms change. Can I fill the system with another manufacturers lubricant? In short, no. We have developed lubricants specifically for use with the Revo units. We know that the makeup/structure of our lubricants are compatible with all of the materials within the system. We are currently speaking to other manufacturers about the opportunity for them to design fluids that can be used in our system. Due to the unknown materials and construction of other manufacturer lubricants we cannot at this stage recommend other products until we have linked with these manufacturers to understand their chemical construction. Where possible we will give manufacturers the opportunity to work with us to develop their own lubricant for the system. Does it fit all bicycles? The Revo systems are designed to be able to be fitted to most off the shelf production bicycles, with the exception of hybrid one off bicycles and those with single speed mechanisms. Where possible the design has tried to incorporate as many configurations as possible. The key elements to be aware of for fitting our systems are the dimensions of the reservoir and the fitting of the dispenser to the rear-mech. Below are the reservoir dimensions for you to use in sizing up the installation of the reservoir in your chosen location. For installation issues with any specific rear-mech cages or groupsets, simply check out our Technical page for advice and updates. The Revo Via and Revo Terra are designed for a simple installation on most bicycle frames and dérailleur mechanisms. There are multiple bicycle fitment options depending on the type of bicycle and its frame structure/geometry. The Revo Via and Terra can be installed in a bottle cage location directly, using the bottle cage extender bracket so you can continue with two bottles, or with zip ties and rubber straps. Each kit comes with a complete installation guide and video tutorials are available on how to complete every element of the install. The systems can be installed by either a competent technical end user or bicycle shop technician. We would recommend allowing 30 minutes to 1 hour for the installation. Please refer to the video Install guides for Revo Via and Revo Terra before fitting. What are your recommendations for settings? The batteries are easily replaced by using a small coin to remove the cap on the top of the unit – turn 20 degrees anti-clockwise to open. Remove and replace the batteries and complete the reverse process. How do I fill the system up? The system is easily filled through an aperture on the left side of the unit. Simply remove the small rubber bung, fill to just below the hole and then replace the bung. See image below for Revo Via. The filler plug on the Revo Terra is in the same location. How often do I need to fill it up? At only 121grams (the equivalent of a couple of energy gels) the performance gain you get from a Revo Via significantly outweighs the additional weight penalty. For the Revo Terra, because Mountain bikes are generally a lot heavier than Road bikes and even though the Revo Terra is slightly heavier than the Revo Via (full weight is still less than 200g – the equivalent of a couple of inner tubes) the additional weight is generally a much smaller percentage of the total bike weight and as such has much less of an impact on performance. We calculated that if the Revo Terra only provided you with 1 watt the performance advantage you gain would still be 1.5 times greater than the weight penalty, so you will always be in a net gain position. What happens if I’m going round a corner, will it dispense fluid and be dangerous for other riders following me? The Revo systems are designed to activate under motion. The software is programmed to stop dispensing fluid when the system is outwith ±30° from vertical (0° – Upright) This ensures no fluid is dispensed on aggressive corners or when the bike is leaned over/turned upside down. If the fluid does fling, how can I be sure that it will not affect my wheels and braking surfaces? If your Revo unit is set at too high a flow rate then any potential fling will tend to fling towards the road in a particle type spray. The construction of our fluid, is a light mineral based biodegradable fluid which is water washable. This means that any fling or contaminants are easily dispersed and do not affect the environment. With regards braking surfaces, due to the washable element it does not affect braking surfaces. The heat applied to these surfaces burns the fluid off extremely quickly and does not affect performance or contaminate braking pads. How much fluid does it use in comparison to other chain lubes? 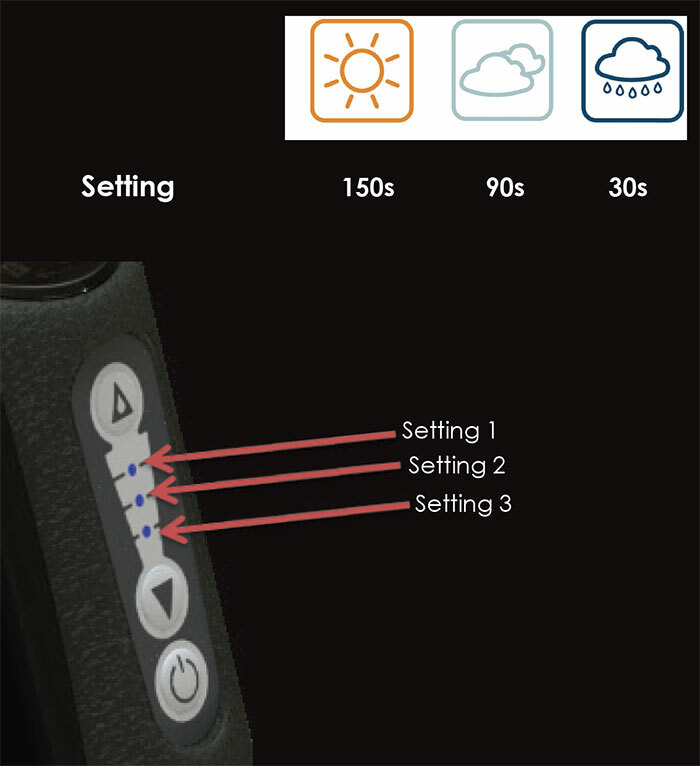 The Revo units dispense 0.03ml (or 1 drop) of fluid at set time intervals depending on the conditions and user preference. Through testing we have identified that approx. 4.35ml of fluid is applied to the chain when using traditional chain lubes. Most of this is excess and will require to be wiped off or will be flung off during the early stages of a ride. Compared to traditional methods the Revo system will take over 1h to put on the same amount of fluid at the fastest flow rate and 6 hours at the slowest flow rate. How does the Revo know when to dispense the fluid? The Revo units dispense the specially formulated Via and Terra Fluids onto the chain at a controlled variable rate via user input (selectable intervals) and through sensing motion of the bicycle. What is the returns policy on Flaér products? What are the shipping times on Flaér products? Deliveries must be signed for. There will be an additional charge if our carrier is unable to deliver on two occasions. Goods will be despatched within five working days unless otherwise indicated. What is the warranty on Flaér products? The warranty granted by Flaér shall be for 24 months from the date of warranty registration or that the Product is first used, whichever is the earlier. If the ownership of the Product is transferred before the end of the warranty period, the remainder of the warranty shall be transferred to the new owner.